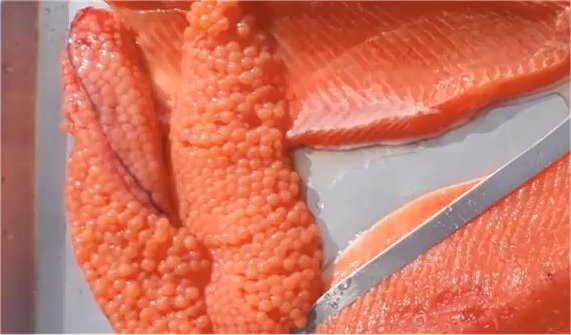 Atlantic Salmon are cultured commercially in Australia. It has been carried out in Tasmania since the mid 1980's and more recently in South Australia, where sea cage farming of Atlantic Salmon has become a major part of the aquaculture industry. To maintain the DISEASE FREE status of Australian atlantic salmon products, there is a total ban on imports of salmon products, other than those canned or hot smoked. Your Atlantic salmon are reared in freshwater hatcheries until they weigh between 70 and 100 grams. They are gradually acclimatised to saltwater over a period of 5 to 7 days, before being transferred to floating, net sea cages in coastal bays for continued growing. All fish farms are licensed under relevant State legislation that controls farm operations even including water supply and discharge. 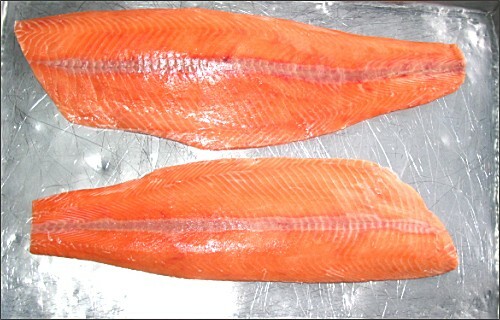 Fillets (skin on, wing off): 78% from whole (gilled and gutted), 67% from whole (ungutted); an extra 3 5% is obtained by taking the remaining flesh off the fish frame. Taste, Texture Mild distinct flavour, soft texture. Since the start of salmon farming in 1998, salmonids production has increased significantly. production. The remaining 965 tonnes were produced in New South Wales and Victoria. 98 per cent of the total value. techniques and apply better disease control measures. The Atlantic salmon is different from the many species of Pacific salmon (Oncorhynchus spp), which are available in the North American market and commonly sold canned.